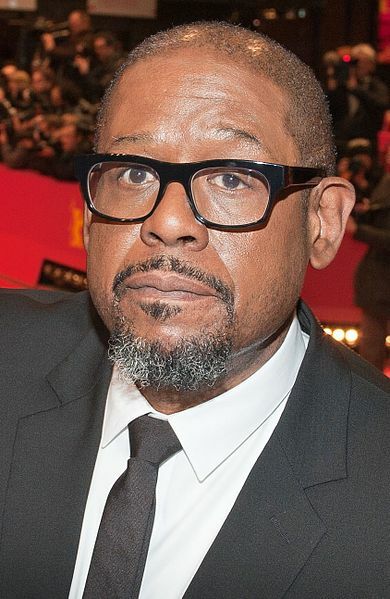 The 88th Academy Awards is next week, and we couldn’t help but take a look back at previous winners. It’s amazing how far Hollywood has come in less than a century! 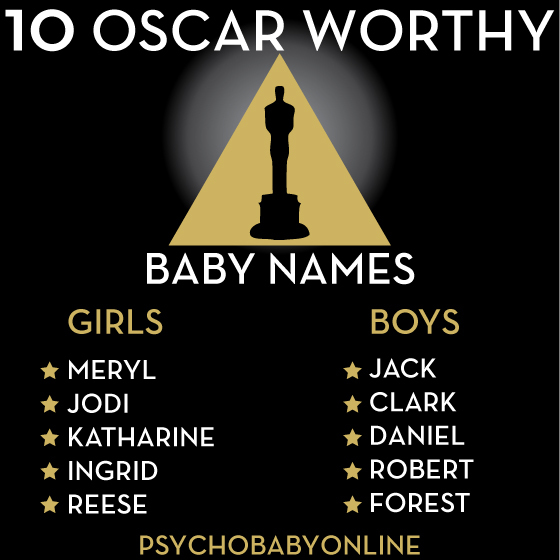 Here are ten of our favorite “Oscar-winning” names – perfect if you have theatrical aspirations for your P’Baby! Meryl Streep – With 19 total (wow! ), she’s scored more nominations than anyone else in Oscar history! 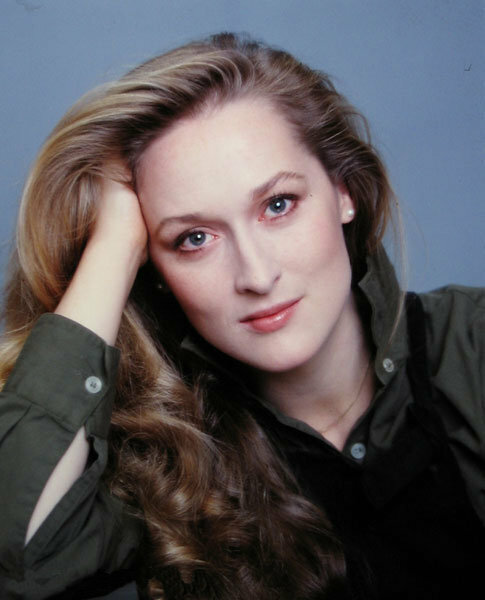 Meryl took home Best Actress awards for Sophie’s Choice and The Iron Lady, and a Best Supporting Actress award for her role in Kramer vs. Kramer. Jodie Foster – winner of two Best Actress awards for The Accused and Silence of the Lambs. 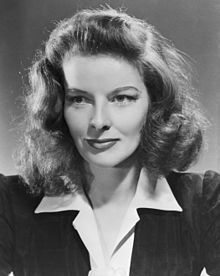 Katharine Hepburn – winner of four Best Actress Oscars for The African Queen, Guess Who’s Coming to Dinner, The Lion in Winter and On Golden Pond. Shout out to director Kathryn Bigelow, the first woman to ever win a Best Director award! 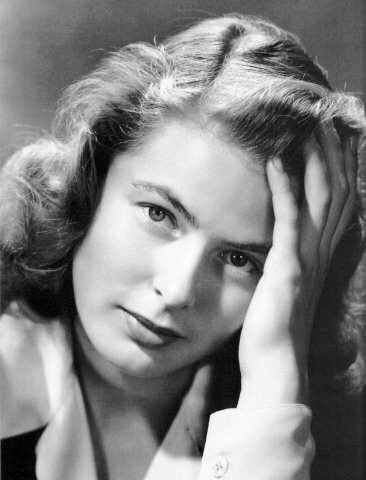 Ingrid Bergman – this Swedish beauty is a three time winner with two Best Actress awards and Best Supporting Actress. Reese Witherspoon – a Best Actress nominee for Wild, she took home the statue for her role as June Carter Cash in Walk The Line. 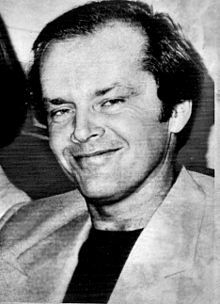 Jack Nicholson – the most nominated male actor in Academy award history, with 12 nominations and 3 wins, including Best Actor for One Flew Over the Cuckoo’s Nest and As Good as It Gets. 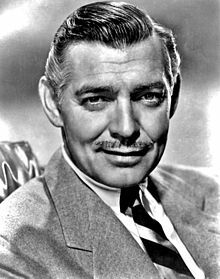 Clark Gable – while only nominated for what is probably his most famous performance as Rhett Butler in Gone With the Wind, he did score a Best Actor statue for It Happened One Night. 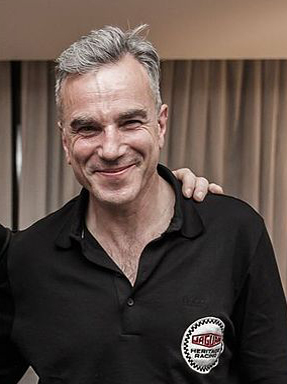 Daniel Day-Lewis – only actor to have received three wins in the “Best Actor” category, ever! His wins include My Left Foot, There Will Be Blood and Lincoln. 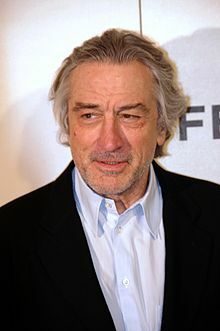 Robert De Niro – nominated for his work in movies like Cape Fear, Taxi Driver, and the Deer Hunter, De Niro took home a Best Supporting Actor award for his role in The Godfather Part II and a Best Actor for Raging Bull. Does your baby have a perfect name for a future star? Share with us in the comments and click here to see our picks for best newborn outfit! Newborn baby clothes can be totally cute and stylish – your brand new baby can be red-carpet ready from day one with these cool styles. 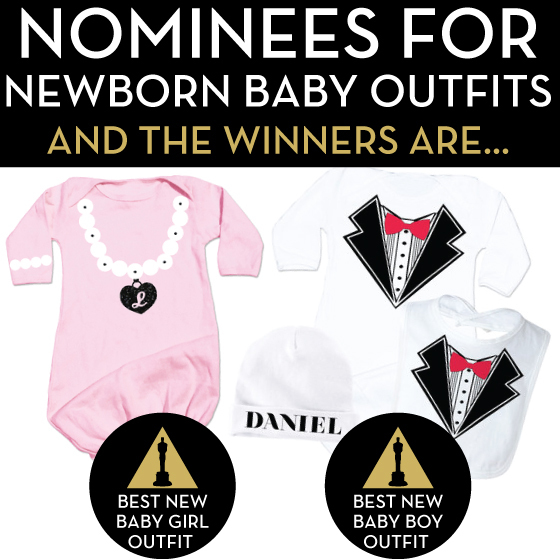 In honor of the upcoming Oscars, we picked these two awesome outfits as our new baby outfit winners! This sweet pink gown is perfect for your little starlet, and your new fella will rock this black-tie inspired baby gown, bib and hat set. Dress up your little one – click here to shop all our baby gowns and newborn gift sets! Hip hop gifts for kids are a great choice year round, but this collection is especially timely seeing as Kanye sort of dropped his latest album this week, re-igniting his weird little feud with T-Swift. All the drama aside, we love these Ye-inspired baby gifts! Click to shop all hip hop baby clothes and hip hop gifts for kids. If you’re on the other side of the lyrical battlefield, you’ll dig these red-lipped, classic Taylor Swift inspired picks. Miss Stefani just released a new single, which we are loving! We heard solo album #3 is on the way, but to tide you over check out these No Doubt lullabies and perfectly pink punk princess gifts. Let Bowie’s legacy live on by letting your littles learn to love him in all his lightning-y glam rock glory! 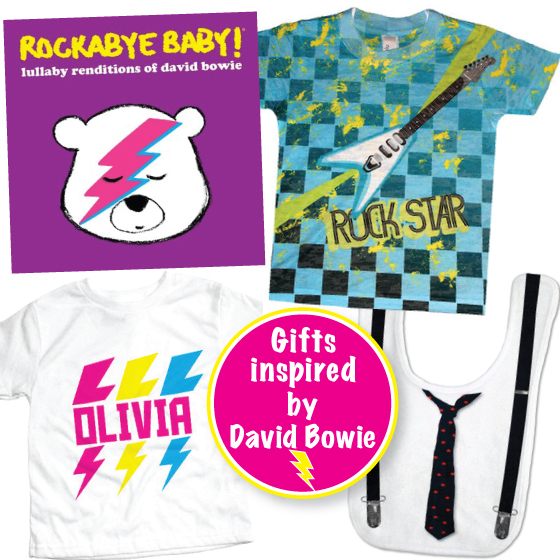 Click here to shop these picks and other rock and roll gifts for kids. 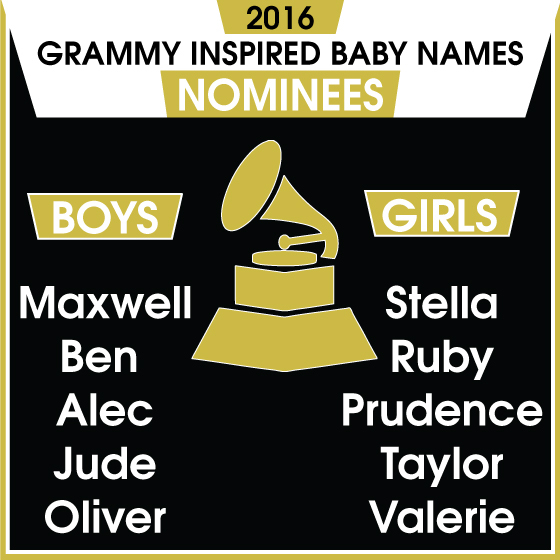 In honor of the Grammys coming up, we put together a list of 10 of our favorite baby names that double as awesome songs! Check out our top 10 picks and the playlist below for these and more cool names-that-are-also-songs!